Join the Alpine Bird Watching Group! 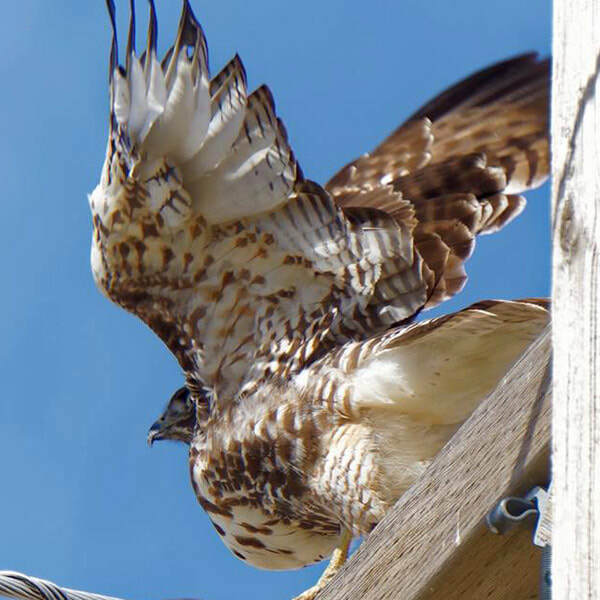 North America's most commonly seen hawk--the Red Tailed Hawk! Birding is one of the fastest growing hobbies in North America. About 50 million Americans plan an outing to observe wild birds every year. It is no longer a hobby just for retirees and people seeking peace and quiet. New technology (digital cameras, apps for identifying birds, and internet access) has made birding more accessible for all ages and types of people. It is an inexpensive hobby that you can do at any time and at any place. It is interesting and challenging as well as relaxing and calming. Birding gets you outside and helps keep you in contact with nature as well as other people. Spring and Fall are ideal times to look for birds as they begin their migration north and south. Winter is also good because it is easier to spot bids in trees without leaves! Watch for birds early in the morning or at the end of the day when they are active and foraging for food. Bring birds to your home by planting native plants around your yard. Listen for their calls and learn to identify them! If you would like to join the Alpine Birders on their next outing, send an email to: alpinenaturecenter@gmail.com or jenniferp312@gmail.com!